As long as I can remember, I’ve always had long hair. Back when I was younger, it was all the way down to my waist. Now that I’m older, it’s gone through various lengths, some shoulder length, but mostly longer than that. I’m cheap and don’t like getting haircuts – haha! Once, I even had my 10 year old brother cut my hair! He was pro. One of the challenges with having longer hair is an easy and convenient way to pull it back so it doesn’t cover the face. You can braid it or pony tail it, but sometimes you want something that’s a little softer and more feminine. 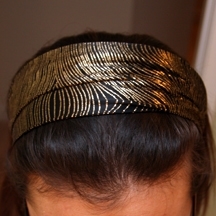 The Gold Stripe Wide Headband is an elastic headband with a generous amount of fabric to cover your hair. One thing I appreciated was that the elastic wasn’t too tight around my head, and also wasn’t too loose. Some elastic headbands are so tight that it makes my head hurt after awhile. This wasn’t the case with the Cover Your Hair headband. Another thing to note about elastic headbands is that sometimes, the elastic isn’t big enough, so it’s a struggle to get it onto your head without scratching your face or knocking off your glasses. 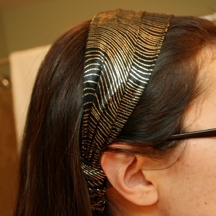 The Cover Your Hair headband was just the right size to put on easily while still maintaining the right amount of tightness to stay on your head. The actual headband seems quite well made to me. I checked out all of the seams and there weren’t any loose ends or threads. The seam where the elastic attaches to fabric seemed strong and durable. Also, the actual elastic piece is covered with matching fabric so it blends in with the rest of the headband. 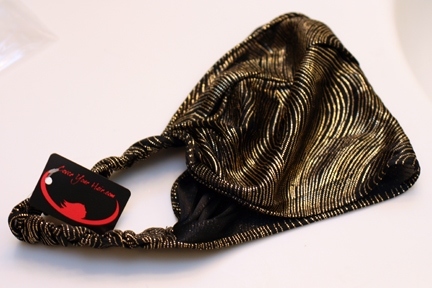 All of the products at www.coveryourhair.com are reasonably priced. I was at a beauty store this morning and saw that their elastic headbands could be up to $25.00 each. 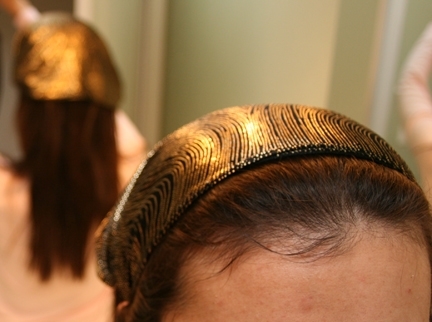 Compare that with Cover Your Hair which offers several in the $10 or less price range. With a wide variety or styles and colors, Cover Your Hair offers a huge selection of products to help you add some flair to your hair. They are currently offering a special gift for orders of $100 on their website. 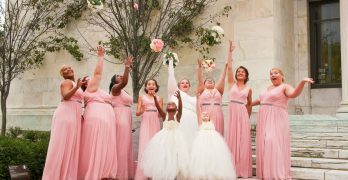 In addition, CoverYourHair.com is giving away a $200 gift card to either Gap, Macy’s, The Children Place, Target, Banana Republic or Toys ‘R Us! You can earn extra raffle entries by referring friends as well. 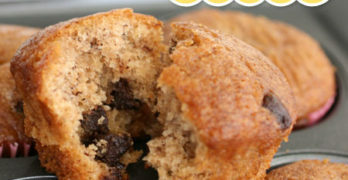 The raffle winner is selected on January 14, 2010 so make sure you enter for your chance to win! You can also get your own gift by entering the WCatDD Cover Your Hair Giveaway! One winner will a free $25 box of surprise hair accessories from Cover Your Hair. This giveaway ended on December 28, 2009 and is now closed. Disclaimer: This post consists of my (and/or fellow tester) opinions only. No compensation was given for this review/giveaway. I did receive a free Cover Your Hair headband from the manufacturer or the representing PR agency to use and test for the purposes of this review. This did not affect the outcome of this review. I love the pink barret! I can really appreciate a woman who is confortable wearing a head wrap, I believe they look regal and elegant. I would like to get one of these for my sister :-). Thanks for sharing the man's perspective on head wraps! Hi Rey,Thanks for sharing the man's perspective on head wraps! I'd love to have the beige warm winter hat. It looks so warm and stylish!